Home Sports Who is Matthew Willock? The 20-year-old could make his first senior debut at Old Trafford today against West Brom, here's all you need to know about the talented player. Jose Mourinho has called up the midfielder following an injury to Juan Mata and Ander Herrera missing through suspension, and could hand the 20-year-old a senior debut against the Baggies. Willock has blossomed for the Red Devils since signing for the side after he was released by rivals Arsenal back in 2012. His brother Chris made his debut for the Gunners in the EFL Cup against Nottingham Forest earlier on in the season, while his other brother Joe is also in the Arsenal academy. Matthew Willock was born in the London Borough of Waltham Forest on August 20, 1996. He was deemed not good enough by Arsenal who released him in 2012 as a 15-year-old. 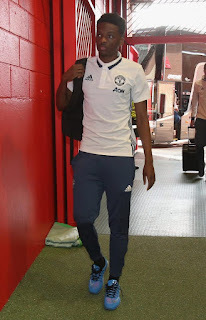 That summer he signed for Manchester United after having trials with Reading and Sudnerland, where he has thrived since making the move up North. His brother Chris Willock made his Arsenal debut against Nottingham Forest this season, while his other brother Joe is in the Gunners youth ranks. He has been given the squad number 42 for his inclusion in the match against West Brom.